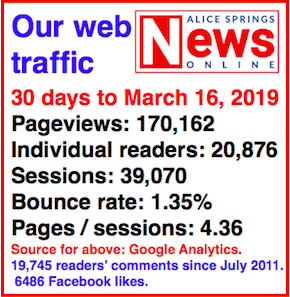 It ended the longest dry spell in Alice Springs but it was hardly a deluge: 3.2 millimeters of rain fell at the airport, beginning just before midnight. Now the trough causing it has passed, at 11am this morning, clouds are clearing and three fine days are forecast. According to the Met Bureau there is still rain falling up high, but it’s not reaching the ground. It was the longest dry spell since figures have been kept, 157 days of no rain, breaking the record set in 1972 when there was no rain at the airport for 147 days in a row. Photo: Droplets glistening on the leaves of a witchetty bush on a rural block near the airport as the sun broke through this morning.